It's time to hit up your local Value Village folks. 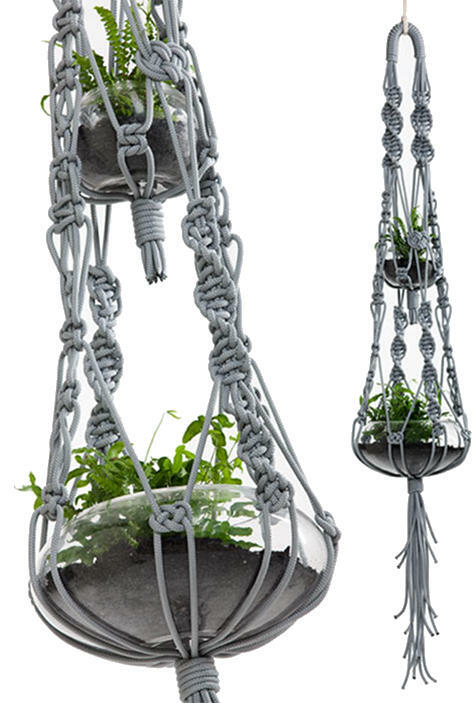 Macramé plant hangers have just turned the corner from desperately-out-of-style to just-coming-into-style again. Don't you love how that happens? Although sometimes referred to as 'Chinese knotting', the history of macramé dates back long before it was discovered in China. It is believed to have had originated in Arabia during the 13th century. When the Moors conquered Spain in 711 AD, they brought this artform with them. From Spain, it spread to other European countries. Sailors then picked up on the technique and kept it alive over the years. While out to sea, these sailors would knot thick twine into decorated pieces that could be sold or traded went they went ashore. The technique was first discovered in China through these sailors. Though macramé has been a little bit passé for the past couple of decades, it has been popular in craft circles as a good way to work with hemp twine. Hemp necklaces are generally created using macramé techniques. 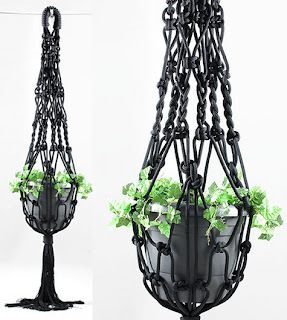 When I was a kid, my mom had a few of these plant hangers. Actually, they are totally functional and are apparently easy to make - if you can tie a knot, you can macramé. I started thinking about them last week, because I saw macrame owls in Urban Outfitters, and I thought plant hangers would be a nice addition to my place. Because I have a condo, I have a lot of windows, but floor space for plants is pretty much maxed out at this time. Since I can't afford those awesome sky planters right now, this is a nice alternative option. Doing some research has now taught me that if I can't find them at vintage shops (or if they only have goldenrod and avacado green) that I could probably make these myself. I think these variations look cool and modern. The artist has used contemporary colours, blacks and greys which means they won't look vintage and instead will match current decor. I imagine these working in a nice way with natural or ivory rope in a Scandinavian-modern decor setting, or a coastal theme decor, as the ropes and knots are reminiscent of sailor's knots. In the grey version the artist has placed glass planters which makes for an dynamic visual. I'm not sure if these are the greatest idea for growing plants in, but so long as the glass planters aren't sitting in hot direct sunlight all day, they should be ok. Here are some step by step guides on how to make them. Sharing some more macrame owl patterns!